Ever since a 6th-grade ancient history class, Susan Rotroff has been fascinated by the Greeks and Romans. Latin was a favorite subject, and Rotroff's early efforts included composing a soulful folk ballad on the wanderings of Aeneas. She first put spade to earth (actually, it was a trowel) at the medieval site of Wharram Percy, in Yorkshire. After graduating from Bryn Mawr, a year at the American School of Classical Studies at Athens gave her a hands-on introduction to Greek archaeology. As a Princeton graduate student, she began in 1970 to work at the Agora excavations. In three seasons, she dug Turkish and Byzantine houses, a classical building, and the garbage dump of Athens' chief magistrates. 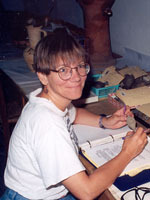 She has published three volumes on the Agora's Hellenistic ceramics. Recently, Rotroff has worked in Turkey on an underwater survey at Kaledran and the excavation of a Roman ship at Kizilburun. Since 1995 she has been on the Classics Department faculty at Washington University in St. Louis. Professor Rotroff was the AIA's 2011/2012 Norton Lecturer.